Politics is intruding on our ability to have a relaxed and fun-filled holiday season, but that’s today’s reality. This week, set aside some time on your calendar to take action for issues that are going to have long-term impact on our country, our organizations, our clients, and ourselves – tax reform, net neutrality and appropriations. Make it fun – put on your favorite holiday songs, pour some hot cocoa, and click away; better yet, have an action party in the office. The to-dos are in bold to make it easier to pick them out. Save the Date: Microlenders Forum will be held on February 13, 2018 in San Francisco. The Goodies – This week’s highlight is that the those wishing to enroll in Covered California for 2018 coverage must do so by December 15, 2017. Yesterday, the Senate voted to conference with the House on tax reform. As the debate developed yesterday, the Senate language for pass-throughs — which provides a 23% deduction on qualified business income — seems to be the favored approach. Members from California are also pushing to preserve the State and Local Tax (SALT) deduction for income taxes and property taxes. The goal for the GOP Leadership is to merge the separate bills and pass reform through both chambers by the end of the year. Invite your mailing list to a Town Hall. Find your Congressmember and input your nonprofit’s (or your) zip code in the upper right corner. contact Senator Dianne Feinstein and Senator Kamala Harris. Expand the Volunteer Income Tax Assistance Program (VITA) to include low-revenue entrepreneurs and small businesses. Oppose provisions that would cripple charities’ and nonprofits’ abilities to serve their communities. Do not use tax reform to weaken or repeal the Johnson Amendment, which keeps divisive partisan politics out of nonprofits. Keep the deduction of state and local taxes; eliminating the deduction from our federal taxes hurts Californians. Make sure the tax reform doesn’t have unintended mistakes that will cost taxpayers. It doesn’t take long. It’s not hard. You’re likely to get someone very nice at the end of the phone who will register your zip code and the main topic that you are calling about. That’s it. Short and sweet, but the calls matter. Give Main Street small business owners a voice during the tax plan process and to help entrepreneurs figure out what the proposals mean for them. Join Businesses for Responsible Tax Reform for a telephone town hall on Wednesday, December 13 at 5:00pm PT // 8:00pm ET to hear how the legislation will impact you and your clients. Also ask them to sign a letter to Congress that asks for common sense reforms to the outdated tax code. Unfortunately, the proposals before Congress largely benefit big corporations and do little to level the playing field for small businesses. Read our op-ed published in The Hill – “Tax reform for the growing gig economy” – for a good summary of the proposals we would like to see. California Asset Building Coalition and the California Budget & Policy Center hosted “The Current Federal Tax Debate and Implications for California” (click to listen to the webinar). National Council of Non Profits has a detailed comparison of the House and Senate tax reform bills. Net neutrality is the idea that Internet service providers can’t block or favor websites. And the FCC is planning to repeal it next week. Seth Godin sums up the problem nicely. Also, CAMEO wrote “Small Business Not Neutral on Net Neutrality” why net neutrality is good for small business. The really quick option is to sign the petition to ‘Save the Internet‘ by Fress Press. 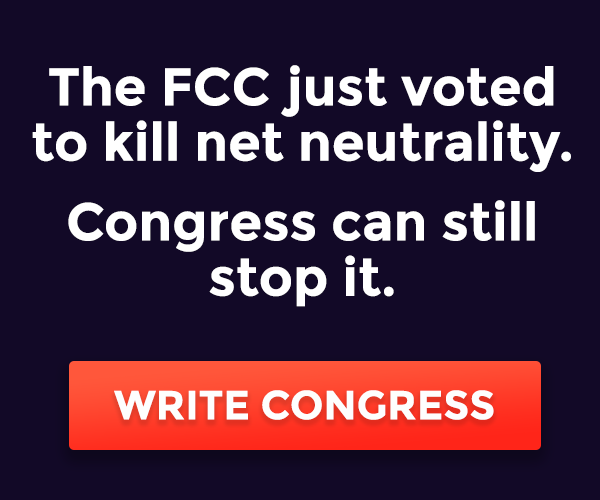 If you have more time, join the BattleForTheNet.com campaign that has driven 750,000 calls to Congress. Through the website you can call Congress or participate in December 12th’s day of action by posting stuff on your website. Download our Appropriations Request for FY 2018, then use the links above to contact your congressmembers (senators and representatives.) Email them sooner than later, but by December 21. For Your Client – Healthcare: Covered California open enrollment for 2018 began November 1 and is open through January 31, 2018. Covered California is the only insurance marketplace in California where eligible consumers can receive financial assistance to help pay for their health insurance. 8 in 10 Californians enrolled in Covered California receive financial assistance with most people being able to find premiums less than $100 per month. Although open enrollment lasts until January 31, 2018, you must enroll by December 15, 2017, in order to have your coverage begin on January 1, 2018. New Resource: Asset Funders Network released “Assessing and Supporting Financial Coaching Training: Strategies for Funders” for practitioners and funders looking to assess and support financial coaching training. The program is goal-focused, time-sensitive, and motivating peer support model that will help your clients achieve their goals. For more information, contact Catherine Marshall. New Report: Stanford Social Innovation and Review’s (SSIR) article by Amy Cortese, “Impact Investing Is Being Democratized-and Marginalized Communities Are Benefiting,” shares findings of how community capital has improved marginalized communities. The first comprehensive snapshot of community investing in the United States points to increased diversity and inclusion for startup funding. Foundations and impact investors should pay attention. For Your Clients: The California Hispanic Chamber of Commerce and Small Business Majority Access are presenting an access to capital webinar in Spanish on December 14 at 10:00am PT // 1:00pm ET. Click the links for registration and information in Spanish. For Your Client: Do you know a small business owner with an amazing success story to tell? If so, submit your nomination today for the 2018 National Small Business Week Awards. All nominations must be mailed or hand delivered to the nearest SBA Office no later than 3:00 pm ET on January 9, 2018. Consult the Awards Guidelines for details. For Your Client: The Specialty Food Association is offering your clients a 25% discount to attend its educational workshop, The Basics, being held at the Mission Bay Conference Center prior to the Winter Fancy Food Show in San Francisco on January 20, 2018, 8:00am-5:00pm. The Basics offers actionable insights on the specialty food industry through sharing valuable business advice from successful industry veterans. It’s a must-attend event for anyone who is learning about the specialty food business, new to Fancy Food Shows, or looking for some fresh insights to enhance their success in the industry. With this offer, the price for The Basics is reduced from $199 to just $149. Offer good for CAMEO members and their clients only. Contact us to get the code for your clients.